Pressures of several hundred bar, temperatures up to 600º Celsius: industrial valves, such as those used in power plants, the oil and gas industry or in chemical process systems, work under the most arduous conditions. In such cases, safety is the most important aspect. Not only the enormous pressure, but also the often toxic or aggressive process media can quickly become a hazard for people and the environment. Valves must not only be perfectly matched to the particular application but also provide protection against an unauthorised access or accidental operation of the valve. System operators can easily prevent both scenarios. The anti-tamper valve head unit from AS-Schneider is equipped with a special Anti-Tamper Key (AT-Key), which fits exactly in the key guide. The valve can therefore only be operated with the AT-Key. In addition to this safety function, installing a padlock prevents the AT-Key being inserted into the key guide. 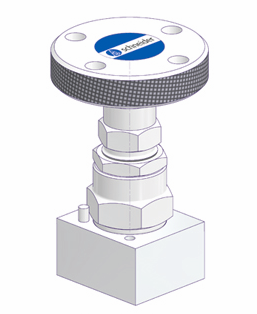 Operating the valve is therefore no longer possible which protects equipment against unauthorised opening and closing of the valve head units. The valve can be locked reliably in any position required. The valves can also be equipped with a stainless steel handwheel and an additional fitted locking plate. This design allows minimum handle movements and is ideal as protection against unauthorised closing of the valve.